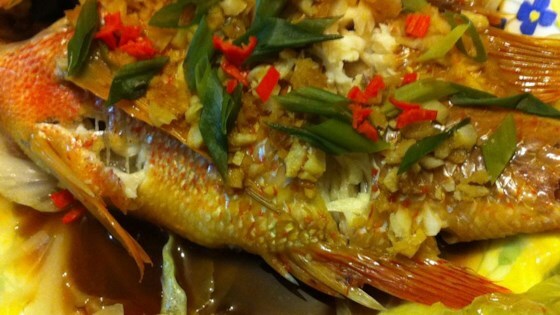 "This is a basic and common Chinese recipe for steamed fish. My father taught me how to make this; it is easy to prepare, hard to mess up, and very versatile. Serve over white rice, using some of the sauce mixture from the steaming bowl." Arrange 1/2 of the green onions on the bottom of the steaming bowl (it is important to steam in a container in order to retain the steam and juices around the fish). Place 1/2 of the mushrooms and Napa cabbage sections on top of the onions. Place fish on top of the vegetables. Sprinkle ginger, garlic, and red pepper flakes over fish. Top with the remaining green onions, mushrooms, and napa cabbage. Drizzle soy sauce and water over everything. Place steam bowl in a steamer over 1 inch of boiling water, and cover. Steam for 15 to 20 minutes, or until fish flakes easily. Garnish with cilantro, if desired. Halibut, cod, or any firm-fleshed white fish will work for this recipe. Nope. This did not work. There are better ways to make halibut. A lot of work for a little bit of flavor. Nice idea but I won't make again. I made this for myself and my father tonight and we liked it a lot! And he likes fried fish but I said we have to eat healthier. He said I could make it again anytime! I didn't have a steamer so I baked it instead. The red pepper flakes add a little kick. This makes a very nice, light, flavorful meal. I will make often.